I don’t think there is a thank you big enough for our AMAZING wedding cake – it was absolutely beautiful and delicious. Thank you for all the time you have spent making the individual ruffles, I don’t know how you do it! You are a baking genius. So so sorry I didn’t get to see you yesterday morning but Elliott and I will definitely pop by at some point next week with the cake stand (I’ll drop you a note when we are back from honeymoon and arrange a date). We just wanted to pop a note over to say thank you for all your work on the cake for our wedding. It was beautiful and just what we’d imagined. It looked amazing set up in the tithe barn! People commented on how delicious the sponge was and the flavours were spot on – with the cake even being mentioned in thank you notes! We’ve attached a picture of the first cut! We just wanted to say a HUGE thank you for our gorgeous and delicious wedding cake. It was so beautiful with the flowers and everyone loved how it sat in such presence in the middle of the dance floor. Each layer tasted lovely; the banana and chocolate chip and the prosecco and raspberry flavours were real guest pleasers! We got a lot of compliments on the cake and we couldn’t have done it with out you. I wanted to thank you so much for our beautiful wedding cake, it looked absolutely spectacular on the day and tasted amazing! Thank you so much to the amazing Elle for making us the most beautiful cake for our recent wedding at Morden Hall, July 2018. She was so easy to work with, did a beautiful job and the cake tasted absolutely outstanding. There was nothing she couldn’t do during the design process and the flavours on offer were second to none. Wouldn’t hesitate to recommend. Elle made my son and his brides wedding cake for us and it was beautiful and tasted wonderful. We had a chocolate layer and a lemon drizzle layer. Our guests kept saying how delicious both layers were and went back for more. just wanted to say thank you so much for the brilliant cupcake tower you made for our wedding! We have received countless compliments on how delicious all the different flavoured cupcakes tasted and indeed we have only recently finished all of the leftovers (my family has enjoyed eating cupcakes everyday since the wedding)! We have kept the top layer fruitcake to eat on our first anniversary. Thanks again for your beautiful and delicious cupcakes! We just wanted to say a massive thank you to Elle for the brilliant cupcake tower she made for our wedding! From the first consultation and cake tasting, we knew that we wanted Elle to make the cakes for our special day. She is so lovely and personable and immediately understood exactly the design and overall aesthetic we had in mind. We have received countless compliments from guests regarding how delicious all the different flavoured cupcakes tasted. We would 100% recommend Designer Cakes by Elle. We wanted to say a huge thank you for the beautiful wedding cake you made for our wedding this summer. It was stunning and our guests commented they were so impressed by the flawless finish they couldn’t believe it was real! We had tiers of a rich chocolate cake, spiced ginger cake and white chocolate and passionfruit. Every flavour tasted absolutely delicious! Thank you again for all your help! Thank you so much for the gorgeous cake, it was amazing!! We were so happy with it and saved some to take home to make sure we got some of each section! The guests all loved it too. We will send you a proper note and a review when we’re back from our honeymoon. I’ve also attached a picture that one of our guests took on the day. I didn’t get a chance to see you on the day, but I wanted to say thank you so much for the cake and macaron favours. They were perfect and delicious! Thank you so much for making our wedding cake. It was brilliant and all of our guests loved it! We loved the intricate detail in the stencilling on the cake and on the petals. The flavours of the cake were amazing. We particularly liked the chocolate and salted caramel! Literally the best cake we’ve ever had! The cake looked beautiful and tasted amazing. We can’t thank you enough. We’ve had so many comments about how good it was from the guests too! I wanted to send you a note to say thank you very much for our beautiful wedding cake. We’ve had such lovely feedback from our guests about not only how stunning it looked but also tasted. I managed to get some of the Carrot & Pecan and chocolate tiers – incredible! Thank you so much for the absolutely stunning wedding cake you made for us. It truly was the highlight of our day and so perfect! Thanks so much for the amazing cake. It was a massive hit at our wedding. It was everything I expected it to be. Everyone loved it! One of our guests said its the best wedding cake she’s ever had! 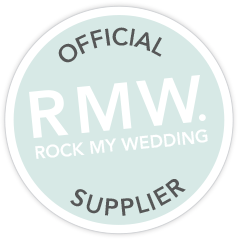 I would like to thank you so much for all your hard work in making our wedding cake and biscuit favours. They were truly delicious and you were a delight to work with. We wanted to thank you for the cake. It was amazing and delicious. I loved especially the Lemon & Limoncello layer and we finished it all!! It was all beyond my expectations. Everybody loved it!! We would like to say thank you very much for our wedding cake. It looked beautiful, the colour of the flowers, the way the cake looked on the stand was everything we were expecting and more. It also tasted delicious as everyone who tasted it commented. It was everything we wanted for our dream wedding and we were glad you were able to deliver it to the very high standards we knew it would be. I never thought a wedding cake could be that tasty! Our wedding cake had one large tier with fresh lime and coconut and one smaller tier with light chocolate sponge and was truly delicious. Elle designed the cake exactly as we wanted it and we received a lot of compliments from our guests. Look no further if you are looking for a wedding cake designer! Thanks Elle! Congratulations on your award! It is very much deserved. The cake was perfect! The cake was marvellous!! When the guests saw it they literally thought it couldn’t be a real one as it looked perfect. It was a real success. Thank you so much for your professional work and smooth communication. We cannot thank you enough for our outrageously gorgeous wedding cake! The amount of compliments we got not just on the design, the size, the beauty but also the taste. OH MY GOODNESS…heaven in your mouth!! Every single flavour is just delicious. We were able to bring some home of each flavour and are still very much enjoying it…Thank you so, so much for making our wedding cake vision come to life and for playing a big part in our day being the best success. I have attached a few guests photos we have of the cake so you can see your stunning work! ‘We loved our cake and had so many comments on how tasty it was! There was plenty too so we have the top layer of fruit cake for a future occasion! I have attached some photos and hopefully will be passing on your details as we had so many comments on how pretty it is. Thank you so much. It just went perfectly with the decoration and we were so happy to find you at such late notice! Thank you so much for making our wedding cake/cupcake tower. We were over the moon and are still getting comments from our guests saying how delicious they were! “Our cake was just wonderful. Elle did a great job at bringing our ideas to life with all of our favourite flavours, macarons and working with our florist Nicola at ‘Flowers by Eve’. Thank you so much for our cake on Saturday it really looked amazing, exactly how we had pictured! And tasted amazing! People were commenting on it all night. I just wanted to say that your cake was so good and everyone loved it! It looked fantastic and tasted amazing! People kept going back for more, including me! Thanks so much – will send you the photographer’s professional photo when I have them in a month or so. Your cake was fantastic, everyone loved it. Thank you so much! You were an absolute pleasure to have as part of our day and the cake went down A STORM!! Fortunately we have a bit left which we are still enjoying. It was truly lovely. Thank you so, so much. Ray and I just wanted to say a big thank you for creating our stunning wedding cake for our wedding last Friday. It was absolutely amazing and better than we had ever dreamed.Thank you for your enthusiasm throughout the planning and for your fantastic baking skills. So many people commented on how delicious the cake was and our cake tasting was one of the most enjoyable and relaxing things we did in the lead up to the wedding. Ray loved the carrot cake too (dairy-free) and there was some left over, which he has been thoroughly enjoying, having a slice a night for the last week! Thank you so much Elle for the delicious wedding cake! Everyone was amazed with it, it looked absolutely stunning! There were more pictures taken of the cake than Tony and I! Everyone couldn’t get enough and loved both the Victoria sponge and Lemon flavours. We can’t thank you enough for putting in the time and care into something so spectacular! “Stunning,” “elegant” and “sophisticated” were words we kept on hearing and it suited our wedding perfectly! Many thanks again! Thank you from the bottom of our heart for the most beautiful wedding cake. Not only was it stunning, but exceptionally delicious. Thanks so much for the amazing wedding cake. It’s one of the best cakes I have ever eaten!!! It looked stunning and all layers tasted fabulous. Jenny wants to send you an official thank you card, but I didn’t want to wait that long to pass on my thanks. We can’t thank you enough for the cake on Saturday. It looked absolutely amazing and it tasted even better. I have had so many compliments from people about it, especially the lime and coconut layer! We had hardly any left come Monday, which I was a little disappointed at given I was looking forward to a full week of eating it but testament to how delicious it was seeing it go so quick. I really can’t wait to see the official photos and will of course send you a few for your reference. I hope making it wasn’t too painful as I know the sugar flowers must have taken a lot of time and effort. Thank you so much and although I don’t intend on getting married again anytime soon, I hope it won’t be the last cake of yours I get to try! Sorry for such a late reply. We have been extremely busy moving abroad! Yes we had a wonderful wedding! Thank you so much for such a beautiful and delicious cake! Everyone loved it! We absolutely loved the tower – the cup cakes were gorgeous and we still have a little of top tier too!!! Everybody asked who did it!!! I should have given out some cards!! I wanted to thank again for the wonderful cake! It was beautiful and so delicious. Our guests loved it and even the chef of Glenmore House complimented it! Thank you so much for our cake it was absolutely beautiful! I’m so sorry we never got to say hello. Everyone loved the cake and they are all after the top tier. We’ve taken it home! 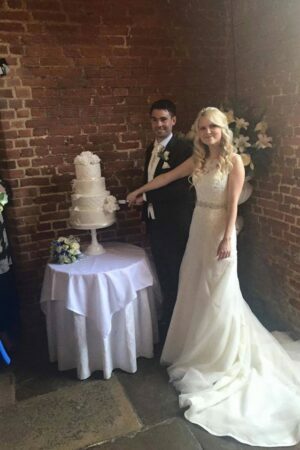 Just an email to say a big thank you for our beautiful wedding cake – it looked and tasted amazing! Thank you also for all of your help and guidance in the planning and designing stages, you were so patient and helpful and I really appreciate it. We are off on honeymoon for two weeks but I will send you some photos as soon as I get back. Thank you Elle for the most beautiful cake fulfilling our vision. You have been so brilliant from the civil to our Indian wedding! Anthony and I just wanted to say thank you so much for making our wedding favours- the macaroons were absolutely delicious and so many of our guests commented on how lovely they were! We had the most incredible day and would love to do it all again!! Matt and I would like to thank you for all your hard work in making a truly stunning wedding cake for us. You delivered nothing less than a first class service from start to finish and the end result was quite simply the cake of our dreams, both in terms of how beautiful it was, and how delicious it tasted. Thank you again for making it so special for us. We have been talking about coming back to you for a smaller cake to celebrate our first anniversary next year! Congratulations on being nominated for two awards – well deserved. We have voted for you for both awards this evening. We wish you the best of luck – do keep us posted. Elle made us a fantastic 5 tier wedding cake in 5 different flavours which really wow’d us and our guests. Elle is a master at making cakes both look and taste fantastic. She worked with us to make sure that we had all the flavours we wanted, including don’t a nut-free fruit cake (to cater for my difficult tastes). She also incorporated elements of our theme into the decoration of the cake, sourcing some beautiful sparkly celtic knots which decorated one of the tier’s and have now become a keepsake for us. The sugar flowers she created for the top of our cake were spectacular as well. If you want a cake which delivers on both looks and taste and someone to make it who is easy to work with, creative and very friendly then look no further. Highly recommend. We just wanted to say a massive thank you for the cake! It was delicious and looked perfect. We wish you all the best with your future weddings. I just wanted to drop you a line to thank you so much for our perfect wedding cake. It went down incredibly well, and we even managed to keep some aside for us to indulge in after the wedding! We had so many compliments about all of the flavours of cake, everyone really loved it. I will certainly be recommending you to everyone we know! Thanks for your wishes. Married life is bliss so far. We LOVED the look & taste of the cake, it was just perfect & exactly what we wanted so thank you. I have attached a few pics, one of us having the happiest day of our life which you contributed to & the beautiful cake you created. We just wanted to say a huge thank you for doing our beautiful and delicious wedding cake. It looked amazing and tasted divine! 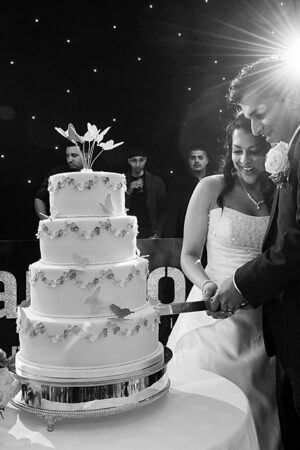 We’ve attached a photo a friend took of us cutting the cake so you can see it in action, as it were! Professional photos to come later – we can’t wait to see those. We will certainly pass on your details to anyone else we know who is in search of a cake. 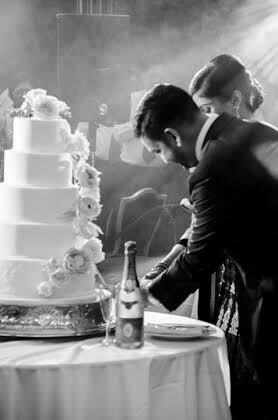 It was wonderful working with you and we couldn’t have been happier with the cake. Thank you so much. Just wanted to say thank you. The boxed macaron favours looked amazing and went down a treat with the guests. Our daughter’s wedding cake was amazing. She chose three flavors and they were all out of this world, our guests are still raving about it. It was a pleasure working with Elle, she was extremely professional throughout the whole process and any questions we had she always got back to us right away. We have no hesitation in highly recommending her warm and skillful services. I just wanted to say a huge thank you, the cake was beautiful, better than I could have imagined it to be, and it tasted amazing. We both wanted to say thank you so much for your beautiful cake & the macarons. It was exactly as we wanted it and was one of the highlights of the day for us. We have also received lots of positive comments. We will be sure to pass on your details to anyone we know getting married. Thank you for making our macaron tower. It looked phenomenal, tasted fantastic and went down a storm. Thanks again and we wish you all the best for the New Year! 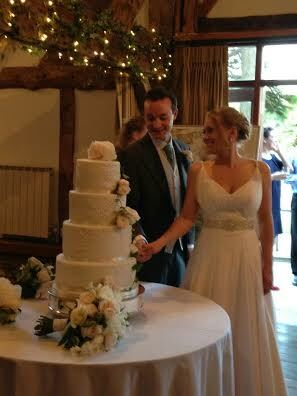 A huge BIG thank you for our beautiful wedding cake – it looked amazing and tasted just as good!! We love the tasting process and meeting you before the day and we really couldn’t have asked for more – thank you! We will be asking you again to make us a cake! Do you do celebration cakes as well? Thank you Elle for a cake to remember forever. Just a quick not to thank you so much for our delicious cakes and other yummies. They were such a success!! I have personally never tasted better marshmallows! What delightful baking, well done! wedding reception on Saturday 9 August with the sugar flower cascade. It was quite simply stunning (and so delicious!). We could not have wished for a more perfect wedding cake. Thank you so much for all your hard work. Dear Elle, We wanted to say a huge thank you for our wedding cake! It was amazing and delicious! Thank you very much for the delicious cake for Pavin’s and Dimple’s wedding at Painshill. We had many compliments for the beautifully decorated cake and it was scrumptious. We hope to work with you in the future. With kind regards, Raj and Tina, Laag, Events Planners and Coordinators. I just wanted to thank you for the amazing wedding cake you made Richard and I! It was absolutely stunning and matched perfectly with everything else at the reception! We had lots of comments on how beautiful it was and how yummy it was too! Although my dads still moaning that he didn’t get enough as it went so quickly! Thank you again I will recommend your beautiful cakes to everyone!! We just wanted to say a huge thank you for our beautiful wedding cake and macarons. It was a pleasure to meet and work with you designing and tasting cake. The spots on the middle tier looked so good, they matched perfectly with our stationary. We were so busy on the day we only got to have one of the cake flavours but thankfully there was cake left over so we both got to have all three in the end! Thanks again for all your hard work in making a beautiful wedding cake and the macarons favours everyone was so impressed with. I have attached a couple of photos from our day. Bride’s mother: Thank you so much for the wedding cake. It was beautiful. I loved it! Thank you so much for the beautiful cake. It was perfect. The sugar flowers were incredible, so lifelike and I shall keep them safely. The cakes were absolutely delicious, every different flavour and the beautiful butterfly biscuits, cake pops, macarons, all the sweet table you made was fabulous and so delicious, everyone loved them. I will send you the photos when I get them back. I was so lucky to find you. We had a fantastic time on Saturday, all went well thank you. Everyone loved the cakes as we did too! Thank you again for your help with choosing the flavours and making the cake to our design. The wedding cake looked SO great. The cake and the macaroons went down VERY well. The cake was absolutely perfect! Thank you so much. We were delighted with it and it was equally as delicious. (I have attached a photo). “A heartfelt thank you from a very happy mother of the bride! You created such a wonderful looking and wonderful tasting wedding cake for Amy and Lawrence. Loved the white roses you crafted for the top. Much commented upon! Thank you SO much”. “Thank you so much for the beautiful cake which you made for our wedding. The shape and design was just what we wanted and I hope that you might be inspired to make one like that again! The cake itself tasted delicious and I would certainly recommend anyone who wishes to order a cake to order it with you. You were such a delight to work with and so calm and reassuring. Thank you again. Fondest regards”.